Even in the context of a policy black hole, it is still possible to deliver affordable housing opportunities if you choose the right model and engage the right people. Drawing on our recent experience in this space, we’re sharing our insights for those looking to get some form of affordable housing project across the line, even in the absence of the ‘holy grail’ policy shift everyone waiting for. This is the second of a two-part blog series. Following from our first blog post, which outlined trends we are witnessing in the affordable housing space, outlined below are our top tips to reducing barriers, garnering internal support and building the financial business case to effectively integrate affordable housing options into your next development. The first and most fundamental barrier to address is the stigma associated with affordable housing. This is particularly the case with some local governments, concerned about an influx of residents that might not fit with their existing cultural mix. This is one that can easily be put to bed. Typically, the level of control over tenancy in affordable housing is surprisingly high. In most instances, affordable housing will be aimed at housing local key workers, such as nurses, teachers and law enforcement. The land owner generally has the remit to work with the Community Housing Provider (CHP) provider to specify the industry and income bracket of the tenant to ensure an appropriate cultural fit and that the local employment holes are addressed. Demonstrating the social value of this in terms of local employment adding to the cultural mix is an important first step to garnering momentum. Many developers and local governments are under the false impression that they need to provide a large number of dwellings in order to make it worthwhile for CHPs to be interested. In fact, if your organisation is risk adverse, it’s much more beneficial to reduce the number of dwelling and increase the length of lease (or partnership) with the CHP. Delivering five or fewer apartments on a 25+ year lease will enable the CHP to leverage the guaranteed future income from these dwellings to finance the delivery of additional affordable dwellings. In essence, long term investment provides a low risk multiplier effect on the social impact. While it’s true that delivering affordable dwellings may potentially result in a net financial loss (in comparison to market value), there are other opportunities that deliver both a positive social outcome for the community as well as a significant financial return that could offset any financial loss from the affordable housing. One example of this is the new Specialist Disability Accommodation Scheme introduced as part of the NDIS, which delivers a monthly payment 20-25% above market rate to land owners for delivering customised accommodation for disabled individuals with high support needs. This is a no-brainer in instances where the developer or land owner are required to deliver accessible housing as part of the local development controls. Another example is the delivery of affordable dwellings integrated into the delivery of innovative aged care solutions. Both of these options add to the cultural fabric and diversity of a precinct or development, whilst ensuring their long term financial sustainability. The vast majority of affordable housing delivered or approved in the last decade have been integrated within large scale apartment-style residential developments. Generally, this means being part of large urban transformation projects (such as those delivered through the Communities Plus Program) or through bespoke integrations into developments in low numbers (usually led by local governments). However, there’s growing momentum behind alternate models at varying densities that is opening affordable housing options to private developers both large and small. According to AHURI, accessory dwellings (granny flats) and co-living houses in residential areas represent the fastest growing form of affordable housing in NSW (numbering over 13,000 rooms since 2009), equating to nearly 5% of total housing output in the Sydney metropolitan region. The significant opportunities for affordable housing to be delivered in medium density suburbia are also highlighted in PwC’s Affordable Housing Initiative, which suggests amendments to planning laws to allow for provision of affordable housing in low-scale development of 3-10 dwellings on single residential lots. Build-to-rent and integrated aged care models are also garnering further interest in the market. 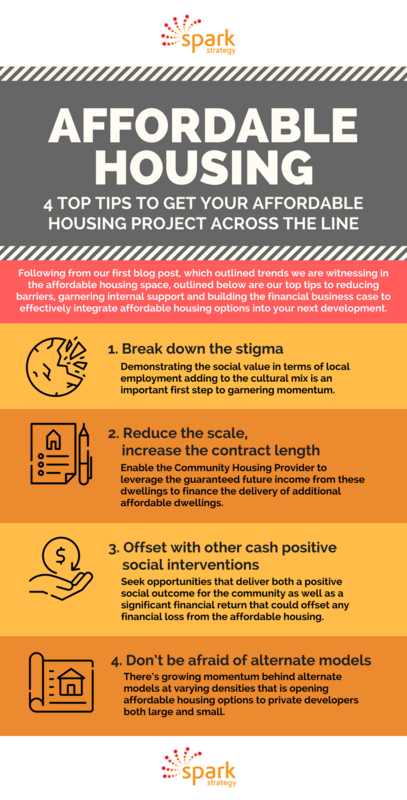 All of these offer opportunities to deliver affordable housing in a cost effective manner. There’s no doubt that significant policy intervention is required to deliver social and affordable housing at scale. However, the absence of policy should not inhibit investigation and action from both the public and private sector, even if the initiatives are on a small scale. Those organisations who actively educate their internal stakeholders, pursue meaningful partnerships and explore innovative ways of tackling this issue will now be better adapted to take advantage of the inevitable market shift. Did anything in this article peak your interest or did you disagree with our take on social and affordable housing? Either way, we’d love to continue the conversation, which you can do with an email to info@sparkstrategy.com.au.